But sometimes there’s no break after the intensity of something like responding to an EDP with a knife. Sometimes you jump out of the frying pan and into the fire. Just ask Durango, Colorado, Corporal Juan Gallegos. He was dispatched to an apartment complex where a man armed with a knife was threatening suicide, according to the Durango Police Department’s Facebook page and Chief of Police, Kamran Afzal. While Gallegos was waiting for backup, a dispatcher said the man with the knife also had some kind of torch and was threatening to burn down the building. So, Gallegos runs into the building and makes contact with the guy with the torch. And just as he did so, another resident of the complex runs up to Gallegos and tells the officer her baby is choking. Gallegos had a tough decision to make. “He told the suicidal man he would be right back. He rushed to the baby, called the medics and then turned the baby over and did the Heimlich maneuver,” Afzal said on Facebook. “Absolutely, he did save the baby’s life,” the chief said. Gallegos switched gears like a true professional and went back to work on the knife/torch guy. He talked to the suicidal man about getting help and managed to get him talking. When he calmed down, another officer took him to the hospital. Chief Afzal says this is just what cops do. Gallegos, like all real heroes, does not consider himself one and wonders what all the fuss is about. He simply wrote down what happened in a report. He didn’t make a big deal of it, Afzal said. The mother of the child called police to say if it wasn’t for Gallegos, she believes she would have lost her child. 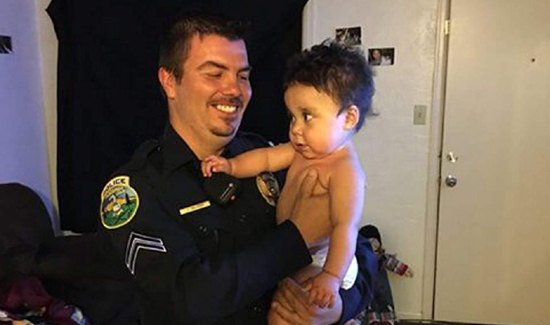 Gallegos returned to the apartment complex a few days later to check on the kid he saved. “We are happy to say that the baby is doing very well thanks to Cpl. Gallegos’ quick response in administering first aid,” the Facebook post says.